The Sequim Blue Hole, or the Sequim Rain Shadow as some call it, is real and here is the proof. 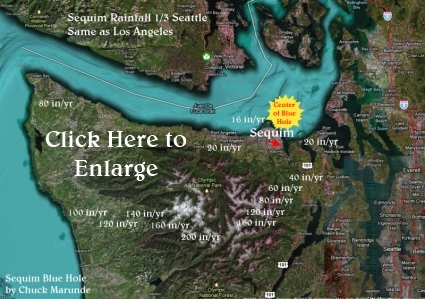 This map shows that Sequim gets an average of 16 inches of rain annually, and in an uneven set of concentric circles extending out from Sequim, the rainfall increases dramatically into the Olympic Mountains to the south until the rainfall reaches 200 inches annually. If you want to live in an area with a manageable and pleasant climate, you may want to live in the Sequim Blue Hole. The great rain forests are only 40 miles as the crow flies south of Sequim in the Olympics. To officially be called a rain forest, the area must receive at least 100 inches of rain annually, and at the peak this area receives 200 inches per year. The Sequim blue hole is explained by scientist Andrew Boyd this way, “During the winter months, strong, moist west winds blow in from the Pacific. The mountains deflect those winds upward from sea level to over seven thousand feet. They’re cooled on the seventy-mile trip across the mountains; almost all the water they contain condenses out in the form of snow or rain. That’s what causes the Olympic rain forests. Then the air, now wrung out and relatively dry — makes its steep descent. 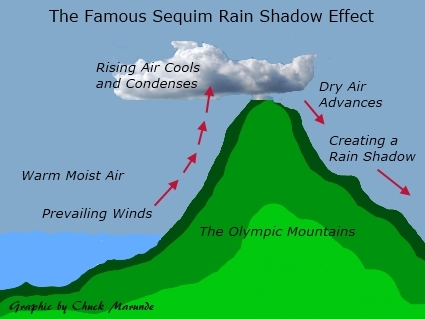 Only after it passes over Sequim, does it begin taking on more water as it heads off toward Seattle.” Now you know how the Sequim blue hole is created. No wonder Sequim is such an incredibly pleasant climate, and no wonder so many retirees have been quietly moving to Sequim for many years. There really is a Sequim blue hole! Click on the image at the top to enlarge it and see how the rainfall increases as you move outward from Sequim toward Port Angeles, Port Townsend, Port Ludlow, and Port Hadlock. The Sequim blue hole is the reason so many retire here. 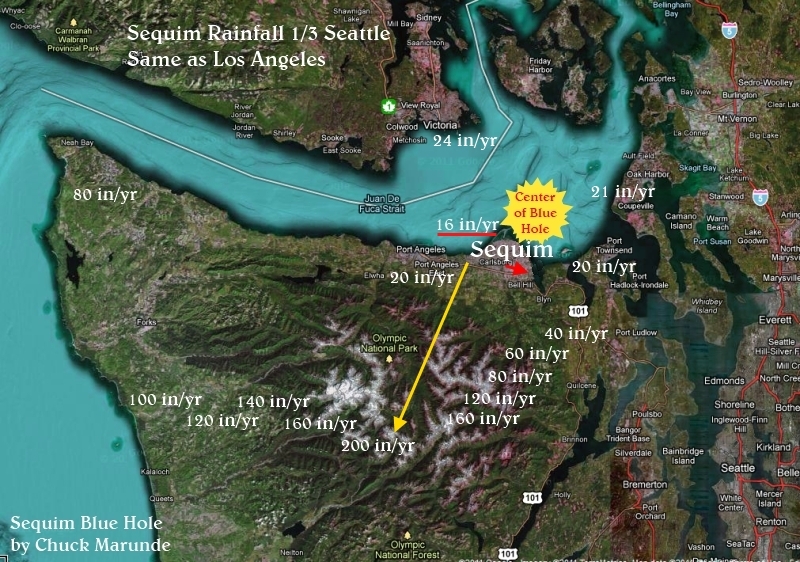 One Response for "The Sequim Blue Hole – A Map of Rainfall"
Vindication! I’m always telling folks about that rainshadow effect in Victoria and Gulf Islands due to the Olympics and prevailing weather from SSW. But for most their eyes glaze over and they nod condescendingly, saying, ‘it rains a lot in Victoria’.